At first I was skeptical whether Beth Adlrich’s book Real Moms Love to Eat would apply to me. I don’t love to eat, and the byline “How to Conduct a Love Affair with Food, Lose Weight, and Feel Fabulous” includes the kind of phase that makes me turn off my attention; I don’t need to lose weight and for most off my life I’ve needed to gain weight. But when I scanned the table of contents I was impressed; all of the topics were sound principles of healthy eating. Beth sets her conversation about food in the context of having an affair - spicy, exciting, and enticing, but having an affair with your husband. She says "you know he’s good for you, so you bring back the joy, the excitement, the flavor of your first exciting encounters. You can trust him. Food isn’t a quick fix, a fling—it’s a marriage, but it can stay spicy forever." Hmmm.... maybe this would be a good book for me! I have a good relationship with my husband, but not with food. As I read the book I concluded that Beth’s approach is great for people on the lower end of the weight spectrum as well as those at the higher end, because among other topics Beth focuses on your relationship with food and provides exercises to help you get in touch with your inner child and food memories. Beth also talks about the importance of hormonal balance, how to work toward it, and how to make healthier food choices. Those choices don’t include “low-fat;” she encourages you to eat real food, not just real foods, but high quality real foods (in moderation). These are just a few of the topics that Beth addresses. Her friendly best-girl-friend tone is easy to read and reminds you not to take things too seriously (except for the bit about the artificial sweetners). Each chapter is informative and encouraging, and Beth’s ten week program helps you implement good eating habits that you might not have down yet (like drinking more water). This book is a must read for any woman* interested in being healthier or looking for more energy and balance in her life. Think it might be just the thing for you? 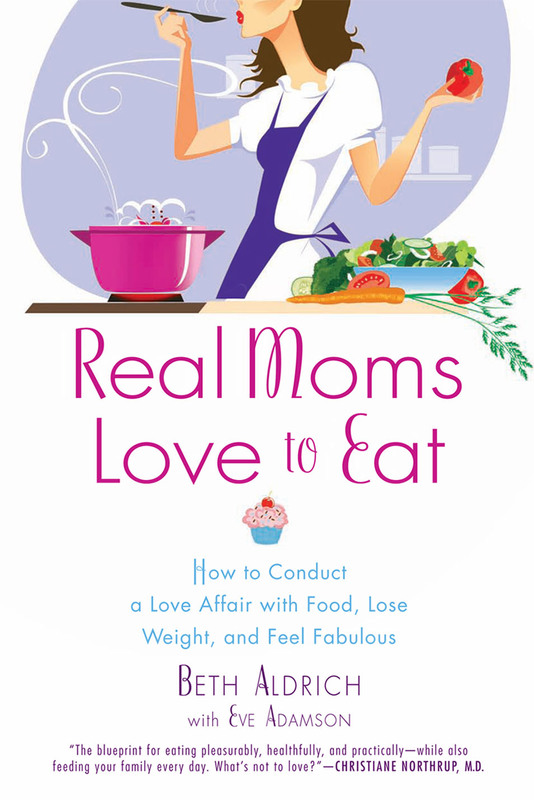 You can preorder Real Moms Love to Eat right here . But if you order through this link: http://www.realmomslovetoeat.com/sweepstakes/ you'll be entered in a sweepstakes Beth is doing, and she's got great prizes! *The information and encouragement in this book would benefit men too, either directly through their own habits or by helping them support the women in their lives. The book sounds great! Your review makes me think of the names Bee and I have given ourselves (Hunny and Bee). She is really LOVES food and learning about healthy eating so I may have to get this book for her. It sounds like one she would really enjoy.